27 July 2018 – Text by Safiria Buono. Time is different on the boat. No night, no day, no meal hours. Everything is at the rhythm of our shifts. Everything also takes longer: getting dressed, cooking, everything. You enjoy the little things: a small and shy sun ray trying to show itself through the fog; the offer of a beer or a banana; two more knots of wind; a card game; or the fact that there is Cenovis on board (only people living in Switzerland can understand this one, it’s like marmite). The meals are the definitely the best part of the day. It’s the moment when we’re finally all together, otherwise some people sleep while other do things and vice versa. But everyone wakes up with the smell of good food! We finished 5L of wine, and more than a half of one of our 5 hams in only two days! 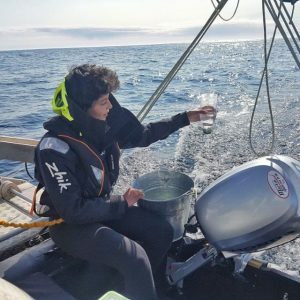 Safiria Buono gathering microplastics samples. It seems that nothing but us exist anymore. No airplanes, no boats. Only few birds… we have seen a few dolphins, a whale, an iceberg crumbling down. 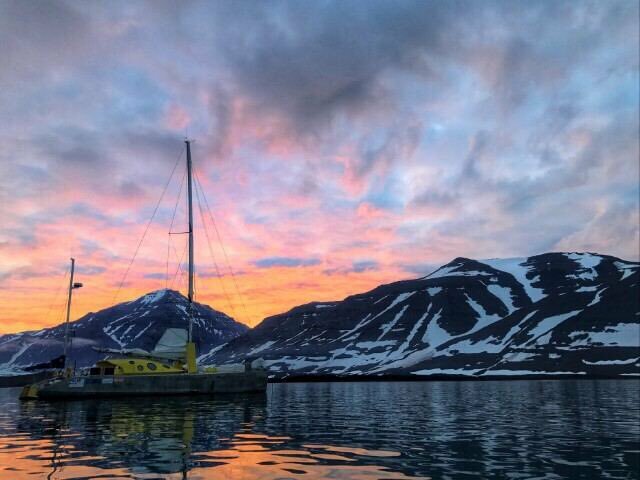 And we had two beautiful, beautiful sunsets to inaugurate the expedition. The sky was on fire, but now the sun no longer sets. We are organised by shifts: 2 hours on shift, then 7 hours of free time. I have had incredible shifts with warm sun and beautiful landscape; and others that end at 4am with cold and fog, checking your watch every two minutes, trying to pass the time singing or finding some games to play. The more time passes, the more time shifts. If you’re lucky, you are on shift when we organize our appetizer! We’re also getting into some habits. For example, Alberto always stays during Kai‘s shift to talk, and then he leaves us his music when he goes to sleep (always about 20 minutes after I start my shift). We have to wake up the person who does the shift after us, and I’m usually woken by Kai. Sometimes with a cup of tea, sometimes he let me sleep 5 minutes more. It’s sweet. During my shifts, I work on the microplastics project. Carrying out sampling with the bottles takes longer than I had thought. The filter is always full of little unidentifiable things: little filaments, and once a small piece of pink plastic. 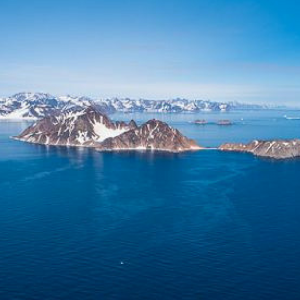 The most important part for sampling was between Greenland and Jan Mayen, because two currents meeting there and can create an accumulation of microplastics. We are now exactly in that zone, so I’m doing 3 samples a day. Mi sono affezionata a questa attività, quasi come un piccolo rituale religioso, una buona azione durante la giornata che, si spera, porterà risultati utilia. Ombretta continues to send results from the PolarQuEEEst detector, everyday after midnight. Sometimes she has to try 8 times till it works! Alberto Rolandi and Mike Struik. Nanuq passes by an iceberg. And so we sail, followed along by music: cumbia, rock ‘n’ roll, blues, soul, the melodic voice of Ella Fitzgerald or the dramatic opera tones of Lucia di Lammermoor. 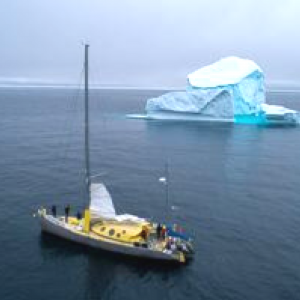 This morning, we sailed between the rest of the icepack (plenty of pieces of ice) doing 9 knots speed just with sails! That was incredibly exciting, and we are happy to see that there is still a bit of ice. 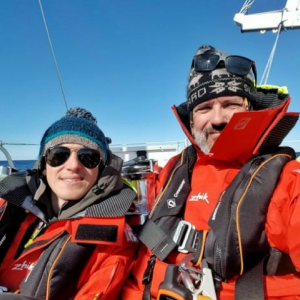 If we continue with this much wind, which is still comfortable, we will arrive at Svalbard in 2 days. Nanuq’s current location – follow along live! Cast off! The adventure begins!